Fishermen know muskies as the “fish of 10,000 casts,” but it’s unclear whether the person who coined that moniker ever fished in Minnesota. Muskie-fishing opportunities abound all across the state, where 99 lakes have fishable populations of the species that can measure more than 50 inches long and weigh more than 50 pounds. The season runs through Dec. 1, and fall is one of the best times to catch a truly monster fish as the fish feed heavily in advance of winter. Muskies are the top predator species in the waters where they live. While the state record, caught in 1957 in Lake Winnibigoshish, weighed 54 pounds and was 56 inches long, most fishermen today release the muskies they catch. For that reason, the Minnesota Department of Natural Resources has set up an alternative record program for muskies that are caught and released. But in the years before that program was in place, it’s likely anglers caught muskies that would have exceeded the state record. Most of those were caught late in the fall. The 99 lakes the Minnesota DNR manages for muskies cover 480,153 acres. While the lakes are scattered throughout the state, there are some bodies of water worth highlighting in each region. 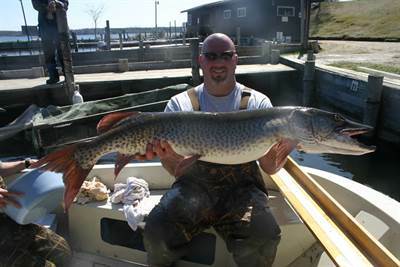 Fox Lake, just north of I-90 between Jackson and Fairmont, is the state’s southernmost muskie destination. Though it’s one of the state’s newest muskies lakes—the DNR started stocking the fish there in 1999—anglers already report catching fish up to 50 inches long. In the Twin Cities area, Lake Minnetonka and White Bear Lake have good muskie populations. North of Alexandria, Lake Miltona has a reputation for churning out big fish, though Lake Mille Lacs may be the state’s muskie-fishing crown jewel. Big Detroit Lake is right in the heart of downtown Detroit Lakes and provides excellent muskie fishing, while the fishing at Leech Lake near Walker is the stuff of legend. Finally, Lake Vermilion in northeast Minnesota has a well-deserved reputation for being one of the state’s top muskie waters. Fishermen using light gear and targeting species such as walleyes hook muskies from time to time, but the anglers who target muskies use stout rods, heavy line and lures that often measure in excess of 12 inches and weigh as much as a pound. They also carry a camera, big nets and pliers, which allow them to quickly subdue and unhook fish before snapping a picture and releasing them. Throughout the year, green vegetation attracts and holds muskies. In the fall, however, vegetation begins to die back, so anglers should find and target green weeds that continue to produce oxygen. Rocky islands and points attract muskies in the fall, too, and many anglers find success by trolling in open water. In this scenario, muskies are chasing schools of high-fat fish such as tullibees, so they may be 40 feet down over 60 feet of water, for example. Anglers can encounter these fish by tying on minnow-imitating baits and trolling across the lake. In addition to the opportunity to catch the fish of a lifetime, muskie fishermen get to enjoy some of the most stunning scenery of the year as the leaves turn colors. Explore Minnesota offers free fall color updates and fishing reports by email. Anglers who want to fish among brilliant fall colors can see where the leaves are changing, and then find a body of water in that area to launch their boats. Learn more about Minnesota's fish, and connect with outfitters and guides to plan your fishing trip.